Its time for an update on the disk media market., based on reporting from The Register's Chris Mellor here and here and here. Financial statements revealed 39.3 million disk drives were shipped, slightly down on the 40.1 million a year ago. But that's 81.2 disk exabytes shipped, much more than the year-ago total of 66.1. The average selling price per drive stayed the same at $63. A look at the disk segment splits shows the long-term slump in disk drive sales as flash takes over in PCs, notebooks and the high-performance enterprise drive areas. Note the graph showing a kickup in "Consumer electronics". This may represent more large customers deciding that cheaper consumer drives are "good enough" for bulk storage. use. 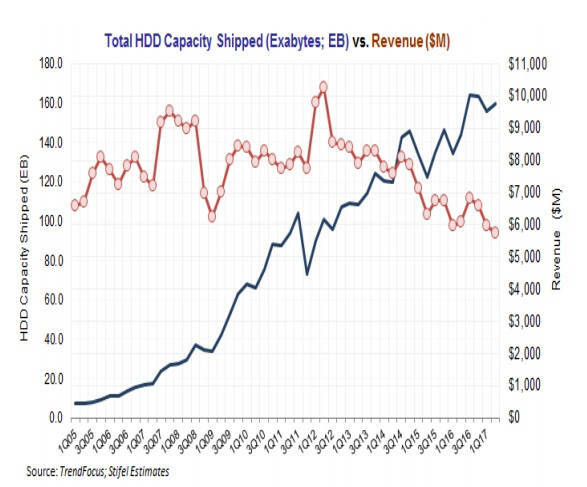 In terms of exabytes shipped – mostly in disk drives – Seagate said enterprise mission-critical exabyte shipments were flat year-on-year, and there was 4.5 per cent growth on the previous quarter. Nearline high capacity enterprise capacity shipped declined 14 per cent, while PC exabyte shipments were up 14.3 per cent year-over-year. 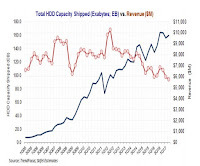 Non-compute exabyte ships were down quarter-on-quarter. 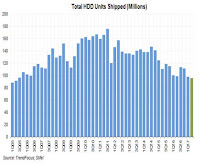 Luczo has Seagate focused on bulk storage of enterprise data on high-capacity disk drives, yet shipments of such drives fell in the quarter as Seagate missed a switchover to 10TB helium-filled drives. Stifel analyst and MD Aaron Rakers sees Western Digital having an 80 per cent ship share in this market. The right-hand side of the chart shows the $2.4bn gap in revenues that is the result of Seagate boss Steve Luczo's failure to break into the flash drive business and being late to helium-filled disk drives. Seagate is now a shrinking business while WD is growing. Steve Luczo will go upstairs to become executive chairman of the board on October 1, with president and chief operating officer Dave Mosley taking over the CEO spot and getting a board slot. Seagate says Luczo will focus on longer-term shareholder value creation, whatever that means. As he’s so far avoided Seagate getting any more involved in the NAND business than if it were playing Trivial Pursuit, we don’t have high hopes for moves in that direction. Seagate's poor performance poses a real problem for the IT industry, similar to problems it has faced in other two-vendor areas, such as AMD's historically poor performance against Intel, and ATI's historically poor performance against Nvidia. The record shows that big customers, reluctant to end up with a single viable supplier of critical components, will support the weaker player by strategic purchases of less-competitive product. imply that Flash averages $0.38/GB where HDD averages $0.036/GB, or ten times cheaper per byte. 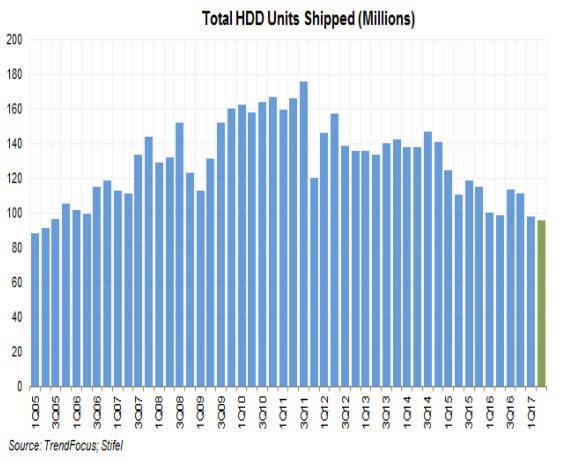 So the industry needs disk vendors to stay in business and continue to invest in increasing density, despite falling unit shipments. Because hard disk is a volume manufacturing business, falling unit shipments tend to put economies of scale into reverse, and reduce profit margins significantly. Kryder's Law implies that capacity shipped will increase faster than revenues. The graph shows capacity shipped increasing while revenues decrease. The IT industry must hope that this trend continues without killing the goose that is laying this golden egg. Why Is The Web "Centralized"?